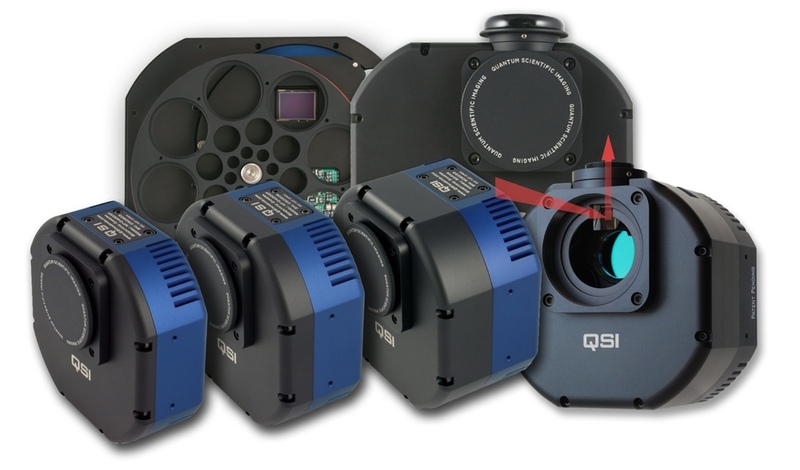 The QSI 683ws8 camera uses a Kodak 8.1mp sensor with micro lenses and it adds, in respect to the 683s, an integrated filter wheel for 8 31,8mm diameter filters. The QSI 683ws8 offers the lowest noise, fast downloads, and exceptional cooling. It's small, light weight and power efficient. 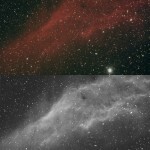 With a diagonal measure of 22.5mm, the KAF-8300 is large enough to provide a wide Field of View (FOV) and still small enough to work with inexpensive 1.25" filters and be fully illuminated by most telescopes. The large 3326x2504 sensor in the QSI 683 provides unprecedented field of view in a camera using standard 1¼" filters. 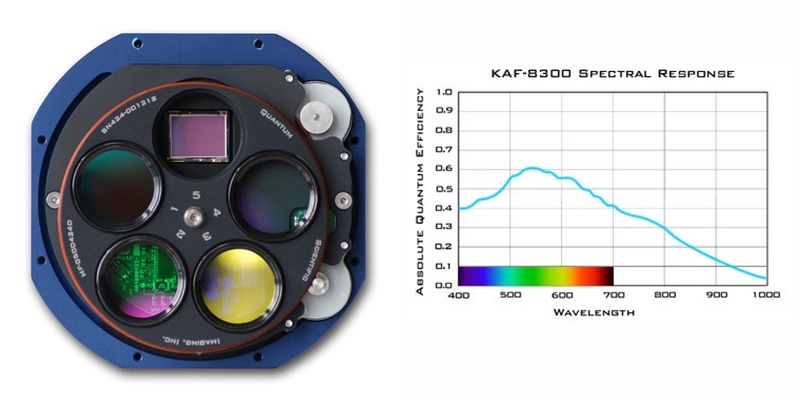 The KAF-8300 sensor has excellent quantum efficiency between 350nm and 1000nm with peak QE over 60%. 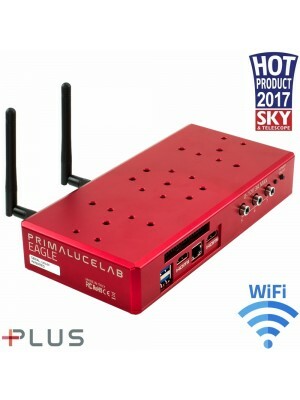 Low dark current and high pixel charge capacity result in a dynamic range exceeding 70db. Micro lenses cover the surface of the CCD to focus the light through the transparent gate to further increase optical response. The 683s camera incorporates QSI's proprietary internal, even-illumination mechanical shutter in the 'mid-size' camera body configuration. The shutter is not only used for timing exposures, but can be left closed to produce 'dark frames' for subsequent image processing. Exposures can be as short as 0.03 seconds or as long as 240 minutes. The shutter is rated for more than 1 million cycles. 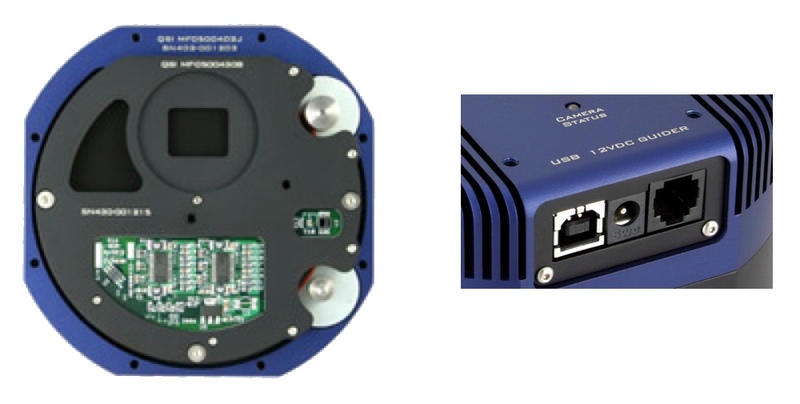 All QSI 600 Series cameras utilize High Speed USB 2.0 port (USB 1.1 compatible) for connection to the host computer and imaging application software. Read and transfer time for an entire 8.3mp image frame is typically approximately one second in High Speed mode and less than 12 seconds in High Quality mode. The frame rate can be further increased by reading just a portion of the image (ROI) or with flexible on-chip binning. A four channel optically isolated control port is accessible through a standard 6 pin modular connector. The signal pin-out is compatible with most modern telescope mount drive correctors and is intended to be used for telescope guiding.